Following his fantastic presentation last Sunday, if you are interested in hearing more about Jon Riedel’s projects in the North Cascades, check out his glacier monitoring webpage. Another very informative site is the Forest Service Climate Change Resource Center, which offers tools to help land managers understand the effects of climate change on our landscape and ecosystems. The site contains a multimedia seminar called “Adapting to Climate Change: A Short Course for Land Managers” which I recommend to anyone who is interested in stewardship of our public lands in the face of environmental change. 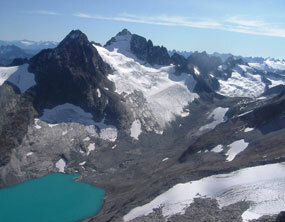 Finally, here is a link to the Parks Climate Challenge video at North Cascades Institute’s site. For those of you who missed it on Sunday, here’s your chance to feel inspired by youth. Who took this beautiful picture of Silver Glacier?